Peter Minuit was a large man, of middle age, whose hair was turning gray, whose eyes were black and dull, and whose manners were quite coarse. The "West Indische Compagnie" (Dutch West India Company) gave to this Governor absolute power over all the Dutch lands in America. His power was equal to that of a king; much more than some kings have had. To be sure, in matters of extreme importance he was supposed to refer to the Company in Holland. But the Netherlands were far away, farther away than it is in these days of fast steamers and the telegraph, and the Company had too many other matters to look after to give much thought to New Netherland. One of the first acts of Governor Minuit was to buy the Island of Manhattan from the Indians, giving them in exchange some beads, some brass ornaments, some bits of glass and some strips of colored cloth; all of which seemed a rich treasure to the Indians, but were in reality worth just 24 dollars. As soon as Minuit had bought the island, he organized a government. In authority next to the Governor was the "koopman" (trader), who was secretary of the province, and bookkeeper at the Company's warehouse, and who worked very hard. Then came the schout-fiscal, who worked still harder, being half sheriff, half attorney-general, and all customs officer. There was also a council of five men who looked wise but had very little to say and did not dare to disagree with the Governor. Although in buying their land Governor Minuit had made the Indians his friends, he took care to be prepared in case they should change their minds and become warlike. He had Kryn Frederick, the Company's engineer, build a solid fort on the spot where the fur-traders' stockade had stood. This he called Fort Amsterdam. It was surrounded by cedar palisades, and was large enough to shelter all the people of the little colony in case of danger. Inside this fort there was a house for the Governor, and outside the walls was a warehouse for furs, and a mill which was run by horse-power, with a large room on the second floor to be used as a church. When Minuit had become fairly settled in his new colony, he divided the lower part of the island into farms, which in those days were called "bouweries." A road which led through these farms was named Bouwerie Lane, and the same road is today known as The Bowery. Minuit had been Governor four years, and there were 200 persons on the island, when the "West Indische Compagnie" (Dutch West India Company), deciding that the colony was not increasing fast enough, made a plan for giving large tracts of land to any man who would go from Holland and take with him fifty persons to make their homes in the New Netherlands. The grants of land, which were really large farms, stretched away in all directions over the territory of New Netherland. But no grant was made on the Island of Manhattan, as the Company reserved that for itself. Each of these farms was called a manor. The man who brought colonists from Holland was called a patroon. He was the Lord of the Manor. He had supreme authority over his colonists, who cleared the land of the trees, planted seeds, gathered the ripened grain, and raised cattle which they gave to the Lord of the Manor as rent. The little town of New Amsterdam was to continue as the seat of government, and the Lords of the Manors were to act under the direction of the Governor. The farms established by these patroons were to belong to them and to their families after them. The one thing that the patroons were not permitted to do was to collect the furs of animals, for these were very valuable and the Company claimed them all. Before many years had passed there was much trouble with these patroons, who did a great deal to make themselves rich, and very little for New Netherland. They traded in furs, notwithstanding they were forbidden to do so, and did all manner of things they should not have done. 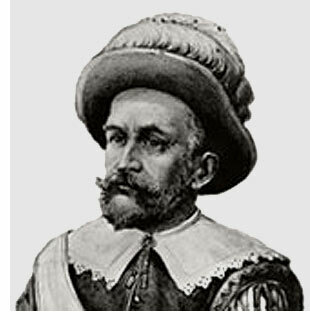 Governor Minuit was himself accused of aiding the patroons to make money at the expense of the "West Indische Compagnie" (Dutch West India Company), and of taking his share of the profit; and finally, the Company ordered him to return to the Netherlands. The ship in which he sailed was wrecked on the coast of England, and Minuit was detained and accused of unlawfully trading in the territory of the King of England. This was not the first time that the English had laid claim to the Dutch lands in America. Charles I was king then, and he said that England owned New Netherland because an English king, more than a hundred years before Hudson's time, had sent John Cabot and his son Sebastian in search of new lands, and they had touched the American shore. But the Dutch called attention to the fact that it had been held, time out of mind, that to own a country one must not only discover it, but must visit it continually, and even buy it from any persons who should be settled there. Even if the Cabots had discovered the land in America, the Dutch had occupied it ever since Hudson's time and had paid the Indians for it. Matters were patched up for the time, and Minuit was permitted to return to Holland. But he was no longer Governor of New Netherland, for his place had been given to another man whose name was Walter Van Twiller.